Entering Atlanta Motor Speedway after a gritty short track battle in a Thursday night race Bristol Motor Speedway event, the NASCAR Camping World Truck Series departed from the small 0.533-mile oval to run one of the series' fastest race tracks. As the Camping World Truck Series drivers and teams took on the 17th event of the 2011 season, emphasis grows on the drivers points standings. A close fight among 4 drivers, ThorSport driver of the #13 Chevrolet Johnny Sauter took the lead in the overall points ahead after Bristol. Turner Motorsports driver James Buescher sat only 7 points behind making the outcome of the following races important in defining the which driver holds an advantage for the championship. Circulating the 1.54-mile speedway fastest during qualifying, Ricky Carmichael claimed the pole for the Good Sam Club 200 driving his #4 Monster Energy Chevrolet at a 177.813 miles per hour average speed. As Carmichael took green ahead of the entire 36-truck field for the Atlanta Motor Speedway event, Sprint Cup regular Clint Bowyer quickly skated around the the #4 truck to lead. Bowyer behind the wheel of the #2 Kevin Harvick Incorporated owned Chevrolet truck would install himself as a fixture at the front of the Good Sam Club 200 field for 97 of the 130 laps completed. As Clint Bowyer dominated the Good Sam Club 200 at Atlanta Motor Speedway, brief interruptions saw fellow Sprint Cup interloper Kyle Busch also leading the event for what was a total of 14 laps. As the Kevin Harvick Incorporated #2 vehicle remained firmly as the class of the field of the NASCAR Camping World Truck race at Atlanta, the Good Sam Club 200 race started off as a big game of catch-up for Bowyer's #33 teammate. Ron Hornaday, starting 17th in the Friday night event, was susceptible to the reaction of 8 rows of vehicles. As Hornaday accelerated his #33 Chevrolet, he was unable to anticipate what was a slower than expected start. Nailing into the rear of another race truck, the #33 Chevrolet ended up with significant front end damage to the truck's driver side corner. Under caution periods, the Kevin Harvick Incorporated pit crew for the #33 truck were able to patch up the mingled sheet metal so Hornaday could compete with the top-10 cars. Despite this potential problem, the #33 Kevin Harvick Incorporated (KHI) team would be able to turn this incident into an advantage later in the event. With 5 cautions slowing the pace of the Camping World Truck Series vehicles during the Good Sam Club 200 race at Atlanta Motor Speedway, two separate cautions claimed top point contenders for the driver's championship. Blowing an engine, series rookie and Red Bull Racing development driver Cole Whitt suffered a quick retirement after only 19 laps of competition. With oil from the #60 Chevrolet drawing a caution, Whitt coasted back to the garage area falling considerably in the points through the summer stretch of racing. On lap 60, the yellow flag flew for a second title contender for the 2011 NASCAR Camping World Truck Series crown. Taking the point lead just one race ago, Johnny Sauter slipped slightly in turn 2 brushing the outer wall. Though the damage largely appeared superficial at first sight, the #13 Chevrolet of Sauter required extensive repair which eventually cost the ThorSport race team to finish 29th, 22 laps off the lead lap truck pace. With the final caution landing on lap 79 and concluding on lap 81, a 49-lap sprint to the finish of the Good Sam Club 200 was going to present the risk of empty vehicle fuel tanks prior to the 130th lap. Front runners including Clint Bowyer and Kyle Busch would all require one final green lap pit stop to travel the remaining lap distance of the Atlanta event. As most teams pitted their race trucks, a select few race vehicles were running on alternate strategies that allowed an opportunity to complete the event without a green-lap pit stop. One of those trucks gambling with strategy on track was the #33 Chevy piloted by Ron Hornaday. Filling up at lap 75, the veteran carried out a fuel conservation plan through the long green flag run to the end. Also pushing to the finish of the Atlanta race on a similar strategy to the #33 truck was the #32 Chevrolet driven by Blake Feese. Feese like Hornaday suffered an on-track mishap which caused the #32 Turner Motorsports team to reconsider their race plans. In the late laps, Blake Feese ran in the runner-up position at a distance from Ron Hornaday's #33 truck. In the final laps, Clint Bowyer and Kyle Busch chased down the lead trucks using the fresher tire they obtained through the recent pit stop. Both Bowyer and Busch were able to catch Feese for position but the interval to Hornaday was too great in the final distance. Ron Hornaday captured his 49th career NASCAR truck series victory after leading the last 17 laps around Atlanta Motor Speedway. Clint Bowyer crossed the checkered flag second assembling a KHI 1-2 finish while Kyle Busch followed closely for a 3rd place result. Blake Feese and the #08 Chevrolet driven by Ryan Newman rounded out the top-five for the Good Sam Club 200 at Atlanta Motor Speedway. The race had a massive effect on the series points with Johnny Sauter and Cole Whitt ending the event with off-key results. A new NASCAR Camping World Truck Series point leader emerged with James Buescher. Only 7 points shy of Sauter entering the Atlanta oval race, a 10th place finish in the #31 Chevy truck gave Buescher the points needed for the top spot for the overall standings. Winning the Atlanta race, Ron Hornaday gained 4 positions giving the 4-time series champion an fighting chance for the 2011 title. 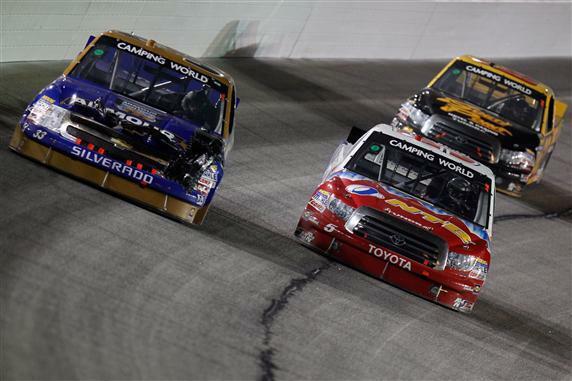 The top-6 in the Camping World Truck Series is separated by 51 points with 8 races remaining on the 2011 schedule.